If dormouse presence is recorded at the development site then a license from the relevant Statutory Nature Conservation Organisation (which in England is Natural England) may be required if the dormice are likely to be affected. Bluebell Ecology can assist with the license application and any required mitigation strategy. 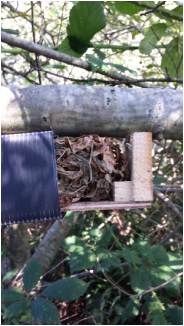 Advice on how to incorporate dormouse habitat into development. Dormouse numbers have declined in number and their distribution throughout the UK due to a combination of habitat loss, fragmentation and deterioration, due to poor habitat management and development. This has resulted in the species being vulnerable to extinction. heathland Culm grassland and other habitats where these occur close to woodland. Some of these sites may be sub-optimal habitat, which results in low densities of dormice, but others often harbour large numbers. Non typical habitat should therefore not necessarily result in an assumed absence. The hazel or common dormouse is protected under both the Conservation of Habitats and Species Regulations 2010 and the Wildlife and Countryside Act 1981 (as amended). Dormice, their resting places and their breeding sites are fully protected in law. deliberately disturb, capture, injure or kill them. disturb or obstruct access to any place used by them for shelter. possess, or sell a wild dormouse.